White cholate bar. Made famous by that little bespectacled kid. Early revenge of the Nerds. Now come on, who does not like white chocolate? Nobody of course. I had a big advantage here, as with my national health glasses I really did look like the Milky Bar Kid, and even my school mates teased me. But, no matter I was happy to buy more white chocolate and enjoy. 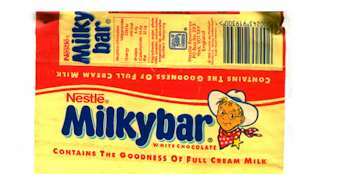 Just so you remember the Milky Bar kid was white, blond hair, silly glasses and annoying. Well that was me too. And we all remember the jingle? Now when you were a kid you pronounced it “nessles,” then somehow it became “neslay”, it was not a bad dream , it actually did change, you were not mad. The white horse, the cowboy environment, and the goodies and the baddies made this a boys white chocolate, but the boys were to have a shock. In the 200s the Milky Bar Kid changed into a girl! Now how on earth did that happen?